AS IT STANDS: I'm guilty of anthropomorphizing animals - Are You? I'm guilty of anthropomorphizing animals - Are You? I treat animals like they were humans. Animal lovers are like that...yeah they are. In my defense, it's not uncommon to anthropomorphize animals and ascribe their behavior to human emotions. 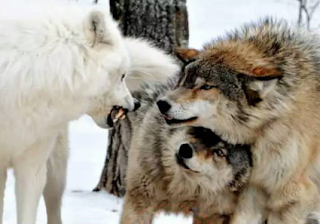 Take the above photo for example: CLAIM: A photograph shows a female wolf protecting a male's throat during a fight. ORIGIN:A photograph purportedly showing a female wolf "pretending" to be scared so that she could protect a male wolf's throat during a fight started recirculating on the internet after it was posted to the web site Reddit in April 2016. While the photograph is real, the caption often associated with it is incorrect. I have to admit, I thought the idea of a female wolf protecting her mate was super cool and believable. But there you have it; I'm one of those people that tend to treat animals like humans. Sometimes I go overboard in my beliefs about animals, but reality usually kicks in, and I discover the rest of the story!